It goes without saying, but I shall say it anyway, that Groundhog Day is one of those movies that gave rise to a notion that has entered popular consciousness. People who haven’t seen it, (even my dad, probably) know Groundhog Day means being stuck in a repeating pattern, forced to go through the same experiences over and over. Even Chris Boardman mentioned it on the Olympics last night as the keirin race was started for the third time. Everyone gets it. It’s this kind of recognition factor that has no doubt made it an attractive property to adapt into a musical show. I’ve noted before that modern librettists have found inspiration in movies: everything from Billy Elliot to Dirty Dancing; familiarity, sentiment and nostalgia for the original helping deliver up a smash hit. 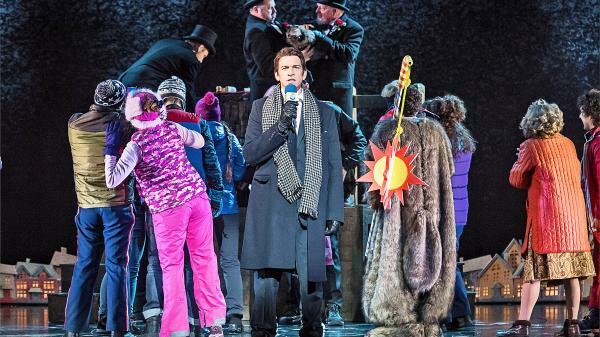 After the storming success of Matilda, Australian songwriter and comedian Tim Minchin has teamed up with the one of Groundhog Day’s original writers — Danny Rubin — and after a couple of weeks of previews, the show (directed by Matthew Warchus) premiered at London’s Old Vic this week. If anybody needs reminding, Groundhog Day is about Phil Connors (played by Bill Murray), an obnoxious TV weatherman required to report – for the nth year running – on a folksy seasonal ceremony from sleepy and snowy Punxsutawney, Pennsylvania. He despises the whimsical ritual and local yokels and can’t wait to get out of there, but discovers he’s trapped. In a bit of cosmic vengeance, Phil is forced to live Groundhog Day over and over until he changes his ways and the curse is lifted. Adapting this into a stage musical feels like it must have been challenge, the plot imposes some major structural constraints. Only one character, Phil, can change and develop, denying us the usual flowering of secondary plots and emotions. And a couple of minor characters perform their own songs, but they’re pointless and fail to land. The show does try to beef up the character of Rita, Phil’s producer, who becomes the focus of his romantic efforts and energies, and the eventually the locus of what remains of meaning in his life. Rita gets the standout song of the show’s first act (and is generally more interesting than Andie MacDowell was in the film – not difficult) but like everyone else who is not Phil she is reset at the start of each day, like a doll in a music box. Another problem is the film’s heavy reliance on Bill Murray’s laconic charisma, his jaded cynicism and mastery of the world-weary reaction shot. It’s tough to pull off this kind of close-up, understated comic work on stage, certainly in a musical, and Stage Phil, played by Broadway import Andy Karl, is altogether slicker, younger, handsomer. More Don Draper than Pete Venkman. While I normally disapprove of stunt casting, and while Karl is perfectly fine, it feels like a bolder casting choice could have been made. Also lost are the movie’s memorable cameos. Everyone remembers Stephen Tobolowsky’s Ned Ryerson, the annoying insurance salesman who accosts Phil each morning, the character sketched in in just a few broad strokes: the gaping mouth, the horn-rimmed glasses, the grating banter. Stage Ned, played by someone altogether too young and too pretty, just in specs and duffel coat, makes little impression. Everyone apart from the principals is doubling up as two or three assorted townsfolk, so you can see why they had to go that way, but it’s a shame it doesn’t work a bit better. Nevertheless, the show just about manages to overcome these structural problems. We go through Groundhog Day with Phil once, then again, then on the third time my bottom began to twitch. Is this it? Is this all we’re going to get? A seemingly endless loop of waking up in the grubby B&B (not to the blaring of Sonny and Cher’s I Got You Babe, as in the movie), chat about coffee with the landlady, the groundhog ceremony, the diner, the restaurant and repeat. But the show has a pretty good sense of when the audience is going to get bored and takes Phil to new places just when you think it might not. There’s an amusing number that skewers quack therapists (one of Minchin’s bete noires) as Phil seeks a psychological cure for his predicament; there’s his alcohol fuelled rampage culminating in a very simply but effectively staged car chase, and the suicide montage that opens the second act is the right blend of dark and comic, and includes again a very simple but effective stage illusion that drew applause from the audience. The ending is moving, feels earned and is beautifully low key. I loved the final tableau – appropriately romantic but I think also tipping the hat to the show’s cinematic origins. Minchin’s songs are pleasing if not particularly memorable and there is plenty of clever wordplay and rhymes – cupboard and L Ron Hubbard, for one. I really liked the show’s big song, Seeing You, which felt like a song I’d always known. Another, along the lines of “if I had to relive one day in my life, couldn’t it have been that one”, offers a neat insight that feels a little underexplored. Whether Groundhog Day will have audiences going back for more (see what I did there?) or is set to repeat (and again?) the transatlantic success of Matilda remains to be seen; I wouldn’t be surprised if its appeal proves too niche and the lack of star pulling power may not help. But it’s inventive and enjoyable. Perhaps because it’s quite a lot like Mark Owen’s Four Minute Warning (although it levels off into something more banal).